In the not-so-distant future, you might not have to tote around a wallet full of plastic cards. A new ATM being developed by Diebold and tested by Citigroup does away with the physical card concept and instead allows a user to authorize the withdrawal of money from an account using iris-scan biometric technology and a smartphone. The machine is one of two new concepts being presented at the Money20/20 conference this week in Las Vegas. Called “Irving,” the self serve machines dispenses cash using a user’s smartphone screen, eliminating the need for a card reader, a pin pad or even as screen on the ATM machine. As a result, the ATM machine is significantly smaller than most standard ATM machines. To withdraw cash, users simply approach the machine, which will connect to their smartphone via NFC or similar secure wireless technology. An iris scan is then used to confirm the identity of the person making the withdrawal. Once a user’s identity is verified, the machine then can dispense cash in a transaction that takes about 10 seconds to complete. The system now is being tested by Citigroup at the bank’s innovation lab in New York. Though the machine offers lightening fast withdrawals and a small footprint for installation, it remains to be seen whether consumers will consent to having their eyeballs scanned in order to access their cash. It may be the younger generation who adopt the technology first and drive its expansion. According to a 2015 survey of 2,000 UK adults by Visa Europe, 76 percent of 16- to 24-year-olds said they would be comfortable authorizing a payment using some form of biometric technology. Most (70 percent) would prefer a fingerprint scan as their primary form of identification, while 39 percent would use a retina scan. 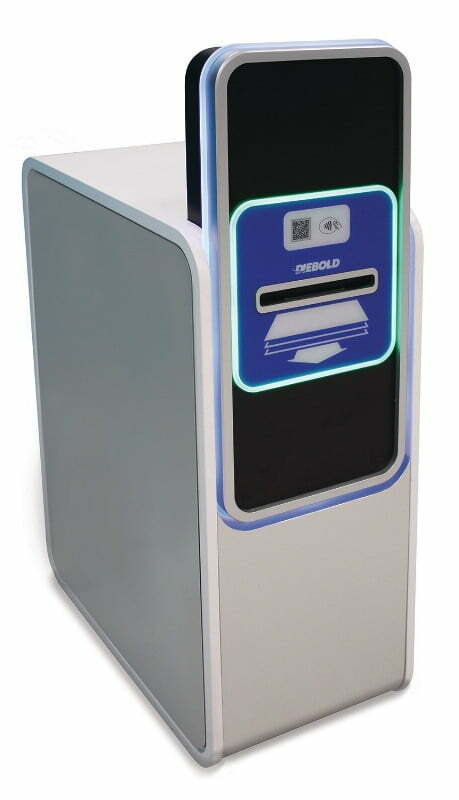 Diebold also is developing a second machine called Janus that would replace a teller inside a bank. The single machine offers dual terminals that can service two customers at the same time. The terminal includes a touch screen for advanced account access and video teller support to help with complex transactions. Neither of these systems are ready for primetime just yet, but keep your fingers crossed and we might see them hit city streets in the next few years.